Fortresses are heavily fortified Outposts, that unless weakened, require a considerable effort to capture. In this guide I'm going to discuss a general strategy and then tactics for capturing each of the Fortresses in Far Cry 4. There are four fortresses in Kyrat with each becoming progressively harder as you work your way through the map. The first of the fortresses is controlled by De Pleur which is shown by a little blue castle icon and the letter D. It's located on the eastern side of Southern Kyrat, just north of the two bear locations. The other fortresses are spread evenly between mid Kyrat and Northern Kyrat. Each of the Fortresses is run by a particular War Lord and during the campaign you'll take on these outlaws head first. Before you venture off to a fortress, consider completing enough of the campaign first. The reason for this is simple - during the campaign you'll weaken the moral of the troops in each region which in turn weakens the regions fortress, making it easier to capture. The most important of those is the mines. Those nasty little things can finish you off before you even get close to the entrance. Although weakening a fortress makes it easier to capture it isn't necessary if you've got the firepower and time to find alternative ways inside. Remember though, you won't have the opportunity to explore all regions of Kyrat in free roam (and their Fortresses) until you complete more of the Campaign. For example, the Northern side of Kyrat isn't exportable until you complete the "Key to the North" campaign mission. Capturing a fortress is achieved by killing every single troop inside, including any reinforcements and helicopters. Like Outposts, Fortresses have a similar strategy. You'll need to decide on your point of entry which provides the least confrontation and best vantage point. Whether you like a full on firefight (myself included) or a sneaky attack with Takedowns, then the strategy will be slightly different. Every fortress has a set of Alarms which work in different ways. For example, in De Pleurs fortress you can hear troops shouting that they'll run to activate the alarm. Killing these troops will avoid the alarm being raised and reinforcements coming in. Alarms are clearly shown on the mini-map and in most cases they'll be little yellow boxes attached to posts. Simply find and shoot/knife the alarms to disable them before the troops can raise the alarm. Make sure you're prepared for an outright firefight before you come along. Equip your most powerful weapons, preferably Assault Rifles or LMG's, not shotguns or SMG's unless you've got the bullet dodging skill unlock. Signature weapons such as the Warrior or other Assault Rifles are good. Grenades and a few Health Syringes are also worth taking along for the journey. Forget bait, knives or bows for this strategy. Most importantly make sure you've got enough ammo. The Firefight strategy provides a quick way to capture the area but comes with an increased risk of reinforcements. Understanding the layout of the fortress is important to this strategy, in particular the location of any stationary weapons such as Mortars. High ground on the walls is the best place to perk because you can easily pick out enemies between the smaller buildings whilst crouching to avoid fire from below. Weapons equipped with the suppressor and aiming for headshots will avoid alerting other enemies too early and help you on the way to securing your vantage point. Always take out the most dangerous enemies first, and by that I mean snipers and head straight for the Mortar area or Heavy Gun if available. These are nicely located on top of the fortress walls. You can sometimes stay unnoticed at this point if you scaled the wall to reach these areas directly rather than venturing through the front gate. 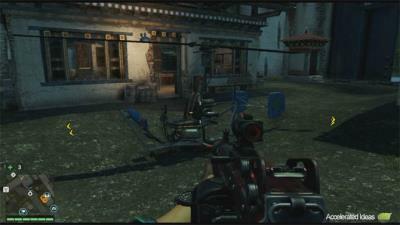 The Mortar is one of the most powerful stationary weapons in Far Cry 4. It has a relatively fast reload and fire rate making it easy to wipe out an entire fortress in under a minute. It's also powerful enough to completely destroy helicopters that are attempting to land and supply reinforcements. Not all the fortresses can be captured using just the Mortar alone since they are half underground and immune to shell fire. As I'll explain below, some of the fortresses have large ammo dumps located in the back. For example, in Noore's fortress there is a huge ammo stash located upstairs in the back chamber. This area will give you all the ammo you'll need and helps avoid any major ammo refills before attempting the fortress. Guns for Hire can be called in at any time to provide backup for your SOLO fortress assault. Guns for Hire tokens are earned when you find Masks of Yalung or complete Karma quests. It's worth noting that the default Guns for Hire guy is pretty lame so you should upgrade the reinforcement level at the Trading Outpost (once you reach the required Karma level). The takedown strategy requires a lot more patience and precision. Again, you'll need to think of the best way into the Fortress which in the case of a sneak attack you'll want to search for high ground over the top or scale the wall using the grapple. Direct line of sight will reveal your position so stay crouched at all times and move slowly and purposely through the smaller rooms inside the fortress. Throw small rocks to turn the enemies attention and force them to turn their backs. This immediately opens up the opportunity for a Takedown. Bait is another useful addition to this strategy and provides a great way to distract the enemy giving you more time to sweep in and out. Depending on the type of animal which comes along you'll either have buy yourself a lot of time or very little. However, if Honey Badgers turn up you'll wish you never used the bait at all! Maxing out your skill tree to take advantage of the Chain Takedown is very advantageous. Not only will you get the opportunity to kill several enemies in one go, but you'll also have the opportunity to use the Knife takedown when the opportunity arises. Maxing out this skill tree is quite easy early in the game. The first fortress you'll come across will be De Pleur's, the blue icon on the map. It's heavily guarded until you complete at least 15 campaign missions to weaken its defences. However, there's an alternate route into the fortress which is accessible from the western side of the fortress. If you venture over there using your climbing skills you'll find high ground which takes you right over the top of the fortress wall. I know, pretty bad fortress construction right! Once over the wall you'll be on the top level, within reach of the sniper to your right. Stay crouched and take out the single sniper guy to secure the wall near the mortar. Now interact with the mortar and swivel it around so it's facing inside the fortress. Aim down the sights to take aim at the enemies inside the fortress, they'll be clearly identifiable by their coloured clothes. Now act quickly to bombard the entire area, wiping out the troops before they can call for reinforcements. This fortress is the easiest one in the game and you should have little trouble capturing it. The second fortress is highlighted with a yellow fortress icon and the letter N on the map. It's on the Western side of the map, North of Banapur and just west of the Kyrat airport. Unlike De Pleur's, this fortress is half buried in the mountainside. This fortress has two heavy weapon points; the mortar and the heavy machine gun, the later being perfect for taking down the choppers, should they arrive. There's also a huge ammo dump located upstairs in the back of the fortress, with ample supplies of grenades and weapon ammo to see you through. Therefore, there's no need to fully refill all your weapons before attempting this fortress, just have enough to see through the first handful of guards. Upon sighting the Fortress you'll see that the front gate is open and the wall is scalable (if the fortress has been weakend). Using your grapple you can get on top of the wall and take out the single sniper guy. Once he's cleared, you've got access to the mortar and a free roam into the back chamber where ammo supplies and the heavy gun post resides. Sadly the gun post can't be swung around 360, but it's good enough to stop enemies flooding in through the front gate should the alarm be raised. I found that this fortress was again quite easy to capture with my Warrior and Rebel signature weapons. The ammo dump provides sufficient ammo, even for launchers and the gun post makes short work of the heavy gunners. Just stay on the move and take cover to heal when necessary. 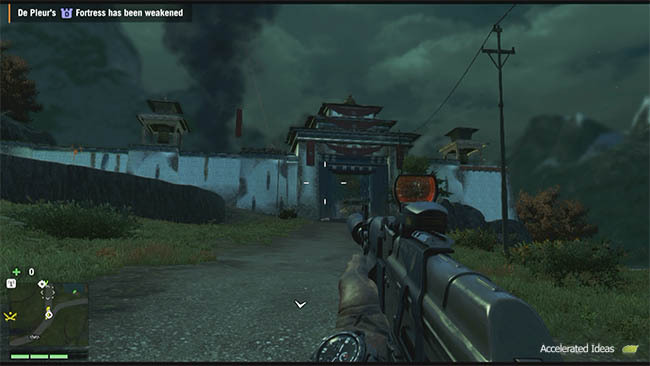 Weakening the Yuma fortress occurs not long after you weaken Noore in the previous campaign missions, meaning that you can conquer half of the fortresses in Far Cry 4 within quick succession. That said, the fortress is in a rather annoying location, just the other side of the huge mountain range and only accessible via the Bridge to the North. You probably won't have liberated any of the few Outposts nearby, meaning that a slow drive is required to reach it. Unlike Noore, this fortress is completely out in the open with no encased sections within the mountainside. Rather unfairly, Yuma breaks the rules for a weakened fortress. It has no open front gate nor any grapple points to help you scale the wall directly. However, it does suffer from the same construction mistakes as De Pleur in that you can literally scale a nearby cliff and hop straight into the fortress. This cliff is located to the left of the main gate. If you check your mini-map you'll see there's a single Mortar located on top of the wall, opposite the side of the fort you climbed into. It's an open area though making it tricky to fire off many Mortar rounds before getting hammered by helicopters. Another notable point is located along the same wall as the mortar. If you face the mortar from inside the fortress, turn left and head along the rooftops there's a spot in the far corner which is completely out of the way. There's one ladder leading to it making it possible to use Takedowns on anyone who comes close, it also provides complete protection from helicopters. Surprisingly, this fortress was easier to capture than Noore but maybe that's because my Buzzsaw wiped out the 3 helicopter reinforcements in a few seconds. 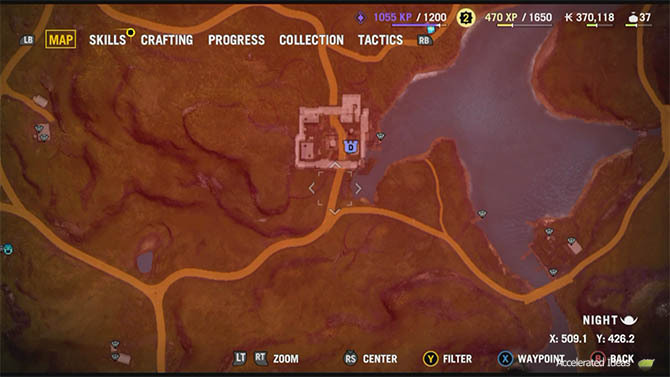 The 4th and final fortress in Far Cry 4 is located in the far North-East corner of the map. It's controlled by Pagan Min the primary antagonist in the game, and surely the best character by far. Like the first two fortresses, this one does respect the weakened fortress rules in that the gates will be open and the front wall is scalable once you reach the necessary stage in the campaign. That said, after completing this fortress I'd say that you can definitely try this one before it gets weakened. The main reason why I say this is because the fortress has an excellent back door to it, accessible via an underground tunnel network (see image above). So rather than going through the front, head round to the rear and give that unguarded entrance a try instead. Whichever route you take, the back entrance/cave area is the best holding spot to take down this fortress. It forces all the enemies troops to come at you through one single entrance making it much easier to fight them. The cave area is at the far end of the fortress, opposite the main entrance. There's a decent supply of ammo there but no heavy gun position or mortar. That doesn't matter by this stage though because you've probably got a Signature weapon or two anyway. All you'll need is a strong LMG or Launcher when the helicopter waves start. Capturing the final Fortress will unlock the AMR Signature weapon at the trading Outpost - an explosive sniper rifle and one of the best Signatures in the game.